So the conversation might go a little something like this..
“Sterling idea then dear. We could take the Daimler, head over to that old trust place near Leominster”. Unfortunately the reality is usually a far more harrowing experience. Half empty pom bear packets flying off in the breeze, leaking bottles of fruit juice reducing the sandwiches to a heavy playdoh like consistency, dairylea triangles & half eaten cherry tomatoes as unwanted cushions, and melted wrapper clinging kit-kats all take the edge off the enjoyment. In fact here I am.. drinking supermarket own brand chocolate milk direct from the bottle, surround by a mountain of filth. Oh the shame! Even Dorothy looks embarrassed to be photographed in such depravity! This is clearly unacceptable and can’t go on, so this summer I’ve called time on 21st century nastiness ruining these otherwise enjoyable days out. All food must be removed from their wrappers at home and placed in suitably chintzy Tupperware containers, drinks should be served in a suitable breaker and poured ideally from an attractive glass bottle, napkins will be used rather than baby wipes, chairs and possibly even a folding table with decorated cloth will be required. Cutlery? I should jolly well hope so! To top this all off the most important addition will be a portable gramaphone. 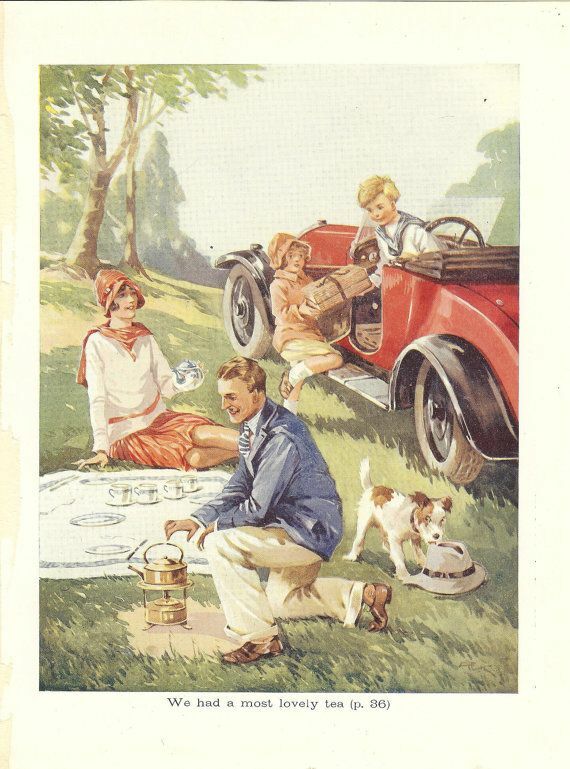 Preferably blasting out a pre-war recording of the teddy bears picnic or similar. 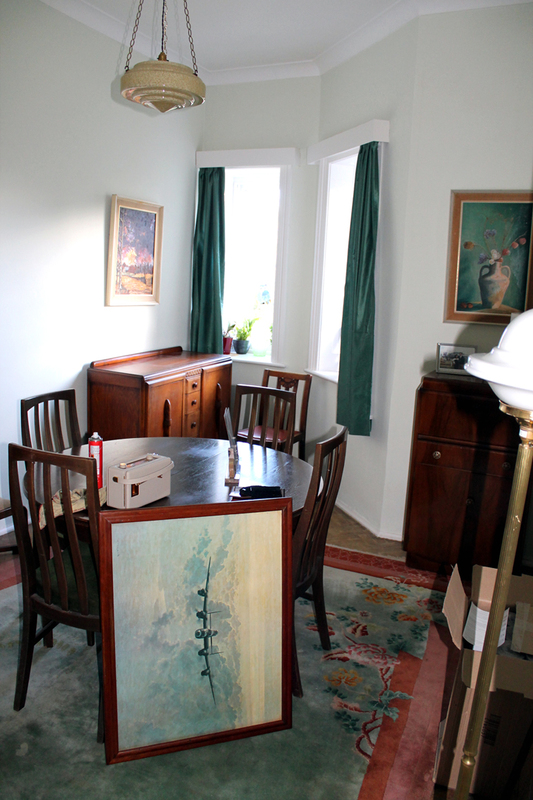 Only once these rules are abided by will I be able to sit back in my picnic chair, cucumber sandwich in one hand, cup of tea in the other and say..
2015 is going to yield some fairly major changes in art deco magpie hq. The forthcoming arrival of our second bright young thing has required us to have a rethink about the layout of the flat and presented a September deadline. The plan is to convert a huge dark cellar room currently used for logs and garden tools into a stylish 30’s inspired kitchen diner, transform our existing kitchen (at the other end of the property) into a third bedroom and use the dining room as an office/study. It may all sound a bit extreme, but trust me.. it’s the only way we can get an extra bedroom in a sensible location. It’s bound to end up being a tedious and expensive project, but should be a huge improvement in the long run. No major work can be undertaken until I’ve had a massive disused oil tank removed. So in the meantime I decided to work backwards by creating my dream study in what was a rarely used dining room. The walls were previously decorated with a bland pale pastel green emulsion. 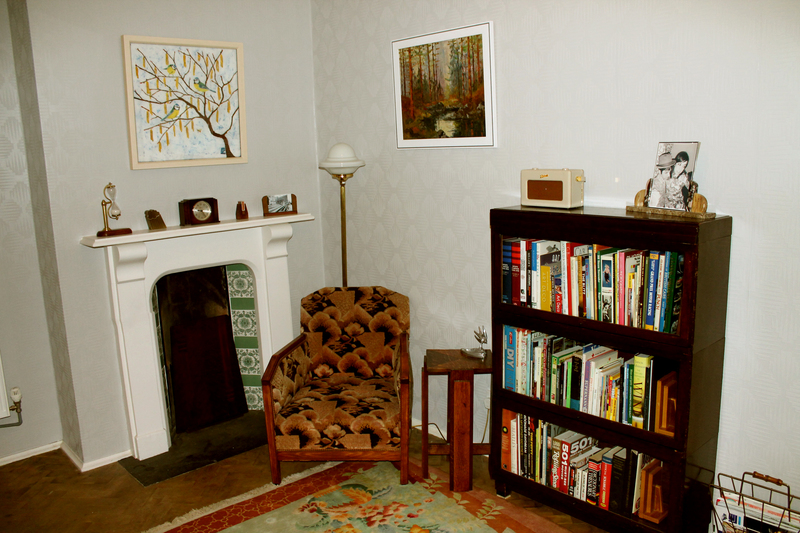 I had planned to give the room a somber 1940’s austerity feel with some light grey paint, but after a successful pre-Christmas experiment with wallpaper in the lounge I opted continue along a similar path with the study. The chosen design is Cavern in Dove Grey, once again by Graham and Brown. The sample looked great, the first few lengths applied… less so. It’s a very angular geometric pattern that when presented in its full glory is perhaps more suited to a brutalist mid-60’s inspired theme. However, we’d committed so it seemed churlish to back out and rip it off. Papering continued, and as we completed each wall and tested pictures and bits of furniture against it the design rapidly grew on us. I’ve already got a few decent bits and pieces to use in the room, which I’ve split diagonally to create two areas. One half centered around a burr walnut veneered desk (an up-cycled dressing table) and filing cabinet (will probably be replaced with an oak one when acquired), the opposite side a reading area with a 1930’s Globe Wernike stacking bookcase and a club chair liberated from our bedroom. 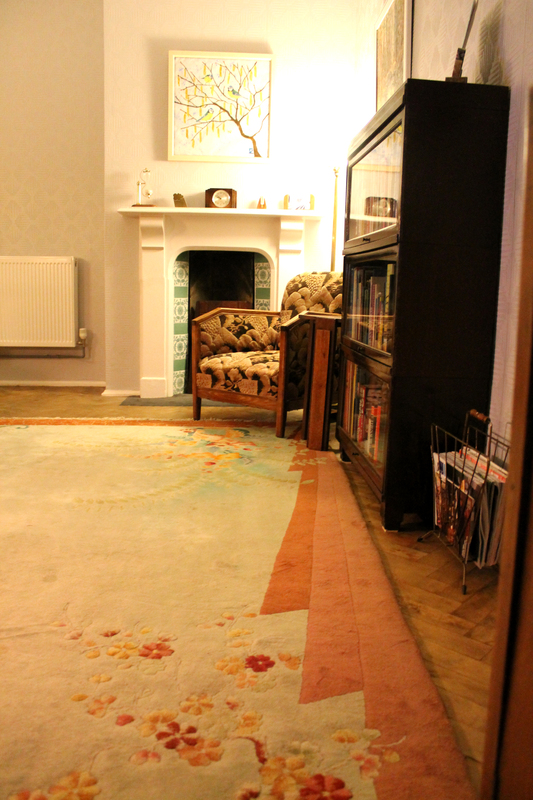 Everything sits on an original handwoven Chinese Art Deco rug bought on the cheap a few years ago. It’s got a whopping great stain in the middle, hence the bargain price, so I’ve booked some professionals to clean it in a few weeks. 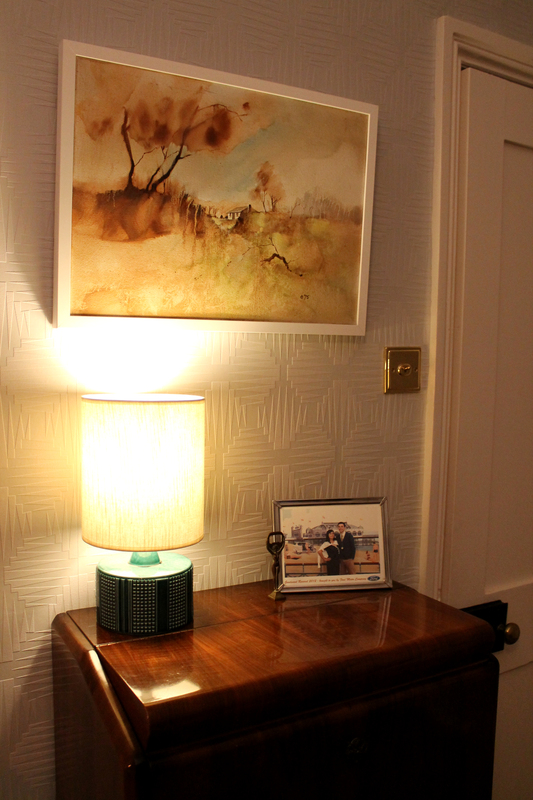 I’m guilty of injecting a pretty eclectic mix of 20th century items with my pre-war paraphernalia here. 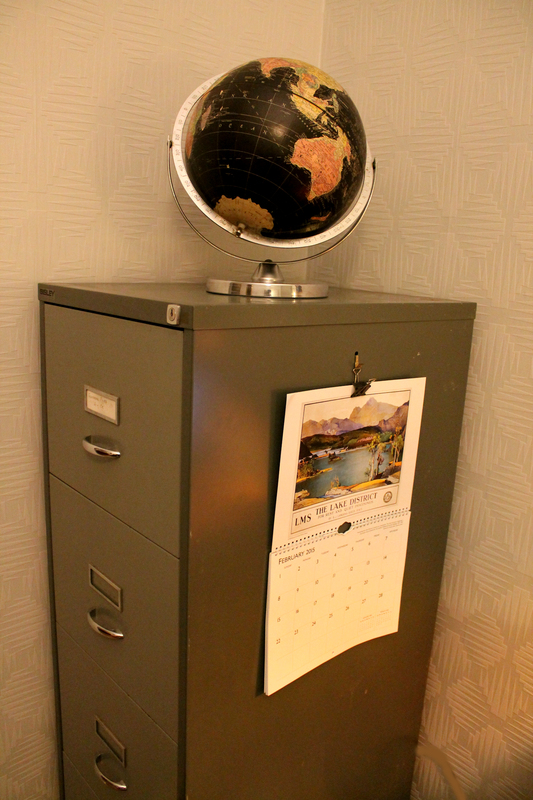 A 1958 Encyclopedia Britannica globe (originally free when signing up for the complete set), 1960’s Poole Pottery Helios lamp & drinks cabinet along with contemporary artworks, but I’d like to think they sit fairly comfortably together. In addition to the filing cabinet, my wish list includes an original Herbert Terry Anglepoise lamp, an old glazed notice board & a groovy swivel chair of some kind. Other than that I think we’re done here.